I have been asked before: Is this school better than this other one?? I should answer this question here for a reminder for those who have asked me before, and also for those who are planning to ask this question. This post may or may not cover the local universities, as most people who have asked were comparing amongst the private education institutes (PEIs). Here is the comparison of the bachelor degrees that are available. But knowing this may not be enough, as there may be other factors coming into play. Distance: May be an issue for some, but I have seen students who travelled half the distance of Singapore, and having to attend class 3 to 4 days a week. Hence this probably is now not a very big issue. Duration: How long does it take? Are your previous studies (e.g. diploma) helping you to get some exemptions? If you do not have any exemptions, the duration should be those as reflected in the comparison above. Cost: As cost may be a sensitive issue for some institutions and may not be revealed, you may wish to check with the local program managers from the different institutions to find it out and do a comparison. Sometimes the fee structures may actually be available online, so make sure to check out their websites first. Class Hours: Are you planning to take it part-time or full-time? What are the percentage of class you will be able to attend? Make sure to check with the program managers on how many hours you have to attend each week, depending on the number of modules/subjects you are taking. Manage your time properly, as this may be the deciding factor in your grades, especially for those who are working. Though a lot of you may be taking night classes, they may still be considered as full-time load if you are actually taking 3 or more modules/subjects in a semester. Specialisation: What is the area of specialisation you wish to get into or are interested in? Does the university/PEI offer this area of expertise and knowledge? This could be checked through the module/subject list that the program offers. This may also be a minor or major offered by the institution. In the comparison above, the majors are included. Prestige of Institution: What is the level of prestige of the institution as compared to other institution? You may wish to compare the PEI to other PEIs, or local university to local university, or even the university you are doing it in with those in their original countries. This might give you an idea of how good the university is in terms of Singapore or their own countries. Talking to your friends/colleagues will give you an idea of whether the institution and program is well-known or not. Quality of Program: This is a hard one to check out, as you may only know until you study there. Hence one way would be to talk to the lecturers and staff there, if they are willing to give you an honest answer. Or you may talk to previous students who you may know of or friends of friends who might have studied there before to give you a clearer picture of what happens in the institution. This is actually one of the more important factors, as once you start paying the school fees, you may not be able to withdraw from the program without losing some money, if you find that the quality of the classes and/or modules are not what you expected them to be. Future education/career possibilities: You might also base your choice what future possibilities you might have if you join the institution. Are you able to get into Honours with that program or inclusive of Honours? Will it enable you to do your Masters and proceed to become a psychologist? Are you learning what you should be learning if you wish to get that (new) job as a counsellor/social worker? If it does not enable you to go anywhere or do anything with the certificate that you are getting at the end of the program, why are you choosing it as one of the choices? 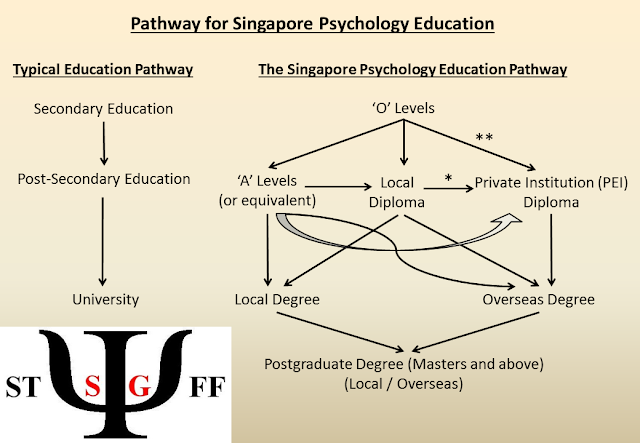 Hope this serves as a good guide towards your choice of institution/university/PEI for your psychological studies.